Slate roofing has been a mainstay for centuries, and for good reason. Not only is it attractive, it’s also extremely durable; a slate roof can last for a century or longer with proper maintenance. But it’s also difficult to install, and can be expensive. That does not, however, mean that you have to forego the classic look of slate for your Arizona home or business. With modern technology and a skilled Arizona roofing contractor like RENCO Roofing, you can reap many of the benefits of a slate roof without the downsides. It’s easier now than ever before to get the look of slate. 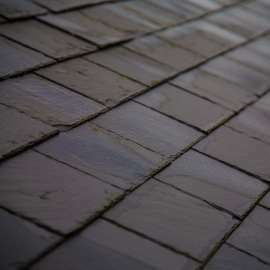 There are actually three different types of slate style shingles: asphalt, metal, and synthetic. Each has advantages relative not only to slate, but also to each other, and to other types of roofing. If your home is like many in Arizona, odds are good that you already have a traditional asphalt roof. Those shingles — called three-tab shingles because of their design — are flat, light, and inexpensive. There’s another type of asphalt shingle, called an architectural shingle, that utilizes several layers of asphalt for a textured look. It’s the least expensive of the options here, while also being more energy-efficient and durable than a traditional asphalt-shingled roof. Most people think of an industrial look when they think of a steel roof. That’s a common style, to be sure, but the CertainTeed metal shingles we use look nothing like the roof on your neighborhood fast-casual restaurant or office park. Instead, they’re designed to mimic the beauty, and much of the durability, of a slate roof, but with a much lighter weight (1/4 that of a slate roof) and a much lower cost. One of the reasons many of us are drawn to slate is that no two slate roofs will be alike. There are subtle variations in color among the slate shingles that’s accented with age, giving your roof a character that many other roofing materials cannot match. That’s why we offer innovative composite products from CertainTeed that — unlike slate roofing — are shatter-resistant, a definite boon in low temperatures, and a feature that makes maintenance much easier than it would be with slate. Which Slate Alternative Shingles Are Right for Me? With so many shingle roofing options, we can understand why you might be experiencing a bit of paralysis-by-analysis. From our own experience, we know that the alternatives to slate roofs have a number of advantages that slate cannot offer- weight, ease of installation, and ease of maintenance, to say nothing of cost. The easiest way to ease a difficult decision is to contact RENCO Roofing. We’ll conduct a free roofing consultation, during which we’ll gather the specifics of your project, evaluate any structural and cost concerns, and make sure that you’re aware of all the short-term and long-term considerations as well as the benefits. Questions? Call us at 602-867-9386 today!